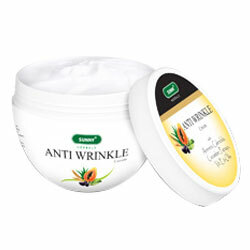 Bakson's Sunny Herbals Anti Wrinkle Cream prevent degeneration, maintains elasticity & hydrates skin. Prevent degeneration, maintains elasticity and hydrates skin. Keeping it firm, supple & wrinkle free with a youthful look. Aloevera - Stimulates fibroblasts making the Skin more elastic and less wrinkled. Papaya- is a rich source of anti-oxidants and phyto nutrients, that helps fight free radicals thereby preventing ageing. Cucumber- being rich in Vitamin E plays an important anti-ageing effect. Massage gently over cleansed skin (face, neck & hand) in a circular motion twice a day. Avoid contact with eyes.